One common task you can add to the SharePoint Framework toolchain is to integrate your custom gulp tasks in the build pipeline. When working with the SharePoint Framework toolchain, it is necessary to define your tasks in the framework's build pipeline. After the task is defined and registered with the pipeline, it is added to the toolchain. This command lists all the available tasks. 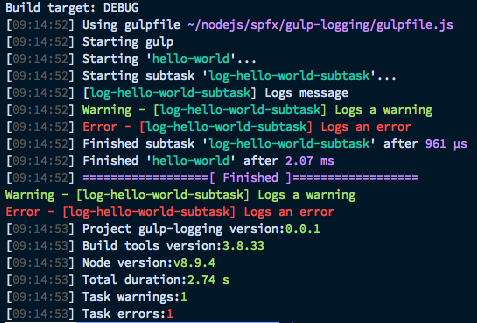 To add your custom tasks, define the custom tasks in the gulpfile.js. Open the gulpfile.js in your code editor. The default code initializes the SharePoint Framework toolchain and the global gulp instance for the toolchain. Any custom tasks added should be defined before initializing the global gulp instance. You cannot execute the subtask registered by using the build.subTask function directly from the command line. You can only execute the task registered by using the build.task function. logError(message: string): Logs an error, and it also adds it to the errors list which will lead the build to fail. fileError(filePath: string, line: number, column: number, warningCode: string: message: string): This logs an error related to a specific file and causes the build to fail. As an example, let's use the image resize gulp task. It's a simple task that allows you to resize images. You can download the completed sample at samples/js-extend-gulp/. Because we are defining the stream, we return the stream in the build.subTask function to the build pipeline. The build pipeline then asynchronously executes this gulp stream.